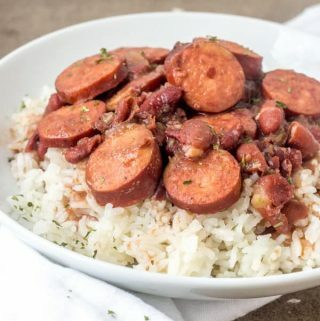 Add all ingredients besides sausage to instant pot, close lid and manually cook for 30 minutes. Quick release the pressure and then add in your sausage. Manual cook for about 15 minutes and then let it naturally release. Once pin is up remove lid and using a potato masher or whatever you have mash about half of your beans. Stir and serve over rice.